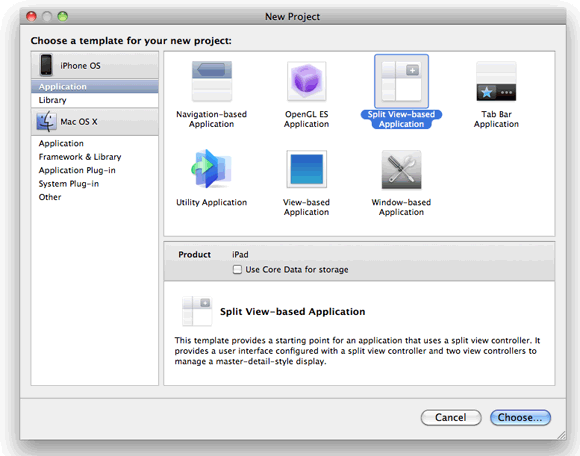 Using Xcode, create a Split View-based Application project and name it splitViewBased (see Figure 1). Observe the files created in the Classes and Resources folder (see Figure 2). 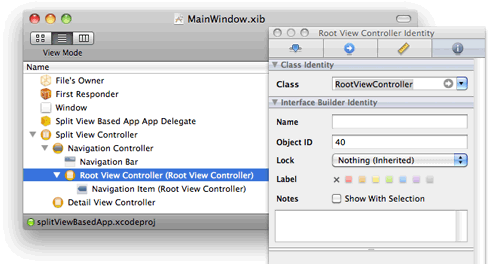 Notice that there are two View Controller classes (RootViewController and DetailViewController) as well as two XIB files (MainWindow.xib and DetailView.xib). Press Command-R in Xcode to test the application on the iPad Simulator. Figure 3 shows the application when it is displayed in landscape mode. When you rotate the simulator to portrait mode, the application now looks like Figure 4. The list of items is now displayed in a PopoverView, a new View available only for the iPad. The magic of a Split View-based Application lies in its transformation when the device is rotated. When in landscape mode, the application displays a list of rows on the left. When it is turned to portrait mode, the list of rows is now hidden in a Popover view. Let's see how this is done. Notice that it contains a view controller object of type UISplitViewController (splitViewController) as well as two view controllers (rootViewController and detailViewController). The UISplitViewController is a container view controller that contains two view controllers, allowing you to implement a master-detail interface. // Add the split view controller's view to the window and display. 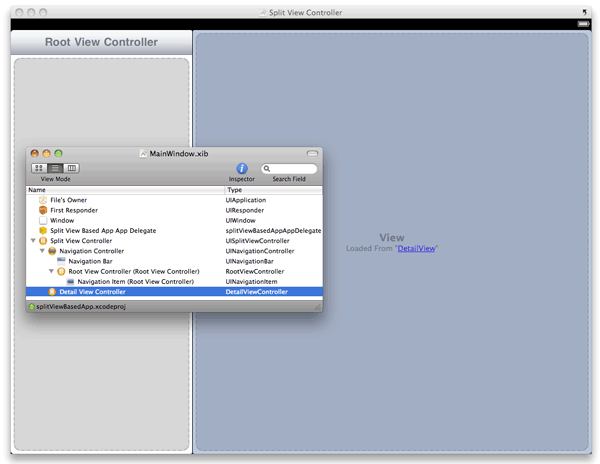 When the application is loaded, the view contained in the splitViewController object is added to the window. Now, double-click on the MainWindow.xib file to edit it in Interface Builder. 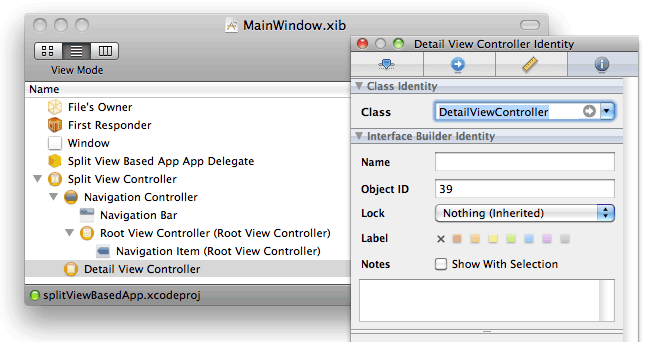 Observe that the MainWindow.xib contains an item named Split View Controller (recall that for a View-based Application project, you will have a View Controller item instead). 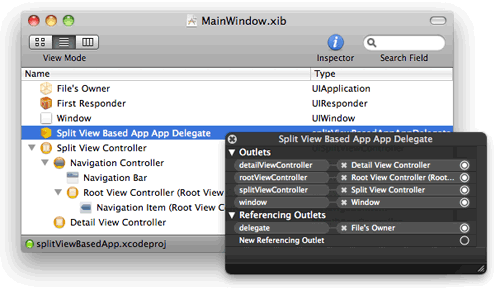 Switch the MainWindow.xib file to display in List view mode and observe the various items located within the Split View Controller item (see Figure 5). The Navigation Controller controls the left side of a Split View-based application. 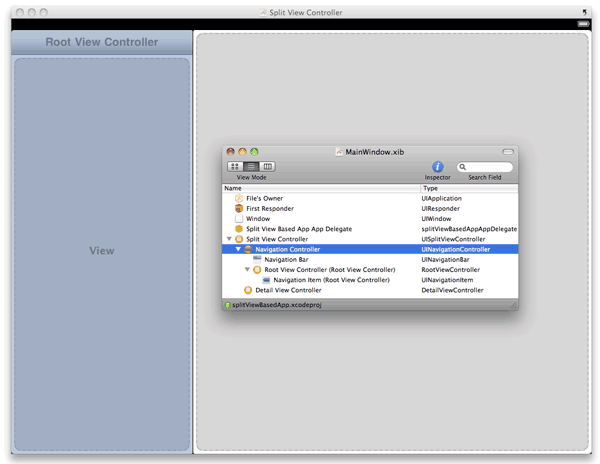 Figure 6 shows that it consists of a Navigation Bar as well as a Root View Controller. The Root View Controller is mapped to the RootViewController class (see Figure 7). The Detail View Controller controls the right side of a split view application (see Figure 8). The Detail View Controller is mapped to the DetailViewController class (see Figure 9). 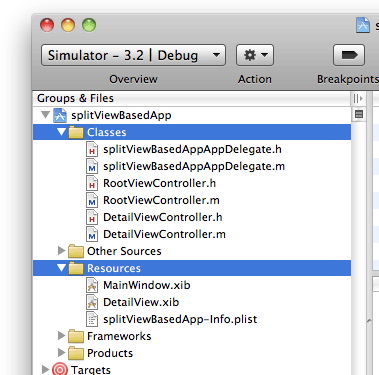 The application delegate is connected to the various view controllers, as you can see when you right-click on the Split View Based App App Delegate item (see Figure 10). 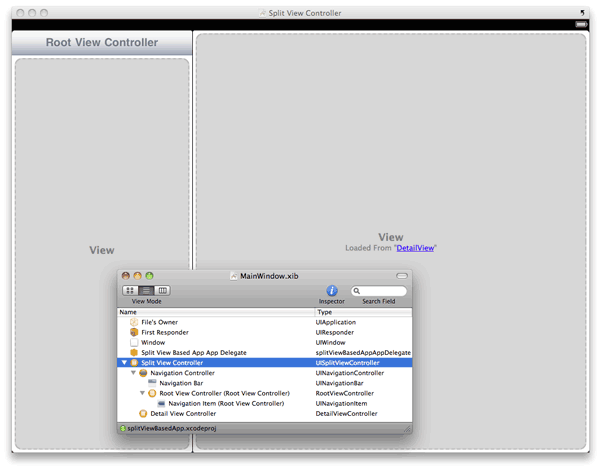 Let's examine the two view controllers that are contained within the Split View Controller - RootViewController and DetailViewController. 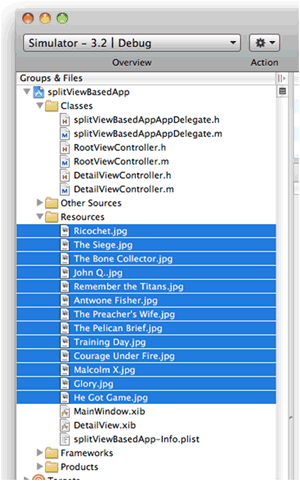 Note that the RootViewController class inherits from the UITableViewController class, not the UIViewController class you would see in a View-based application. The UITableViewController class is a subclass of the UIViewController class, providing the ability to display a table containing rows of data. contentSizeForViewInPopoverView - the size of the PopoverView to display. numberOfSectionsInTableView: - the number of sections to be displayed in the Table view. tableView:numberOfRowsInSection: - the number of rows to be displayed in the Table view. tableView:cellForRowAtIndexPath: - the data to populate for each row. tableView:didSelectRowAtIndexPath: - the row that was selected by the user. 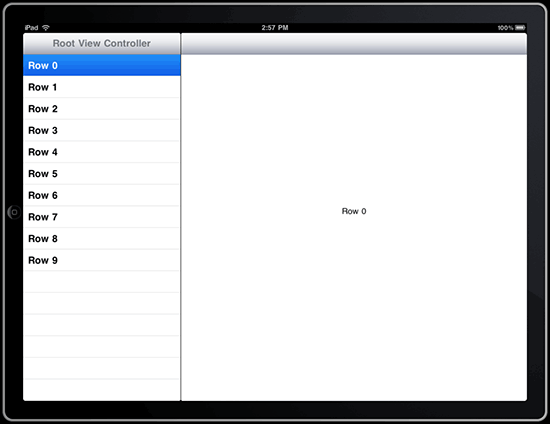 UIPopoverControllerDelegate - It needs to implement this protocol because when the iPad is held in the portrait orientation, the PopoverView will display the content of the Table view. UISplitViewControllerDelegate - It needs to implement this protocol because when the iPad changes orientation, it needs to hide/display the PopoverView. When setting the detail item, update the view and dismiss the popover controller if it's showing. // invalidating the button and popover controller. splitViewController:willHideViewController:withBarButtonItem:forPopoverController: - fired when the iPad switches over to portrait mode (where the PopoverView will be shown and the Table View will be hidden). splitViewController:willShowViewController:invalidatingBarButtonItem: - fired when the iPad switches over to landscape mode (where the PopoverView will be hidden and the Table View will be shown). Now that you have seen a Split View-based Application in action, it is now time to make some changes to it and see how it is useful for the iPad. You will modify the application to show a list of movies and when a movie is selected, a picture will be displayed on the detail view. Double-click the DetailView.xib file to edit it in Interface Builder. 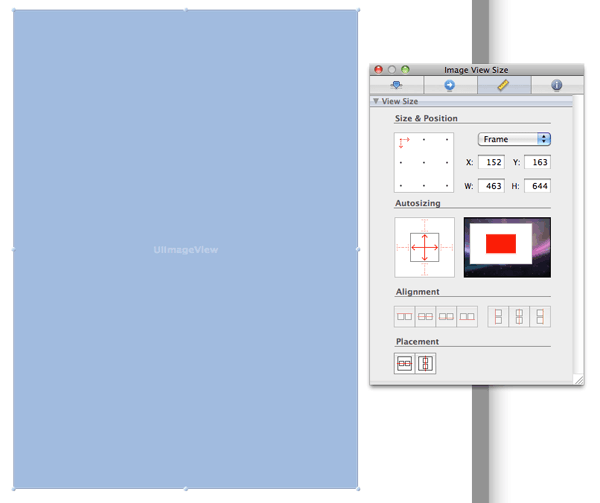 Add an ImageView to the View window and set its Mode to Aspect Fit in the Attributes Inspector window (see Figure 11). 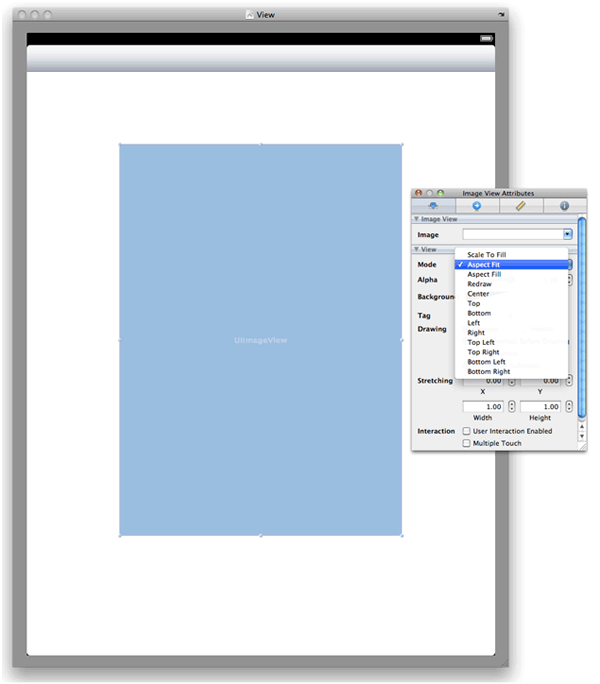 In the Size Inspector window, set is Autosizing attribute as shown in Figure 12. 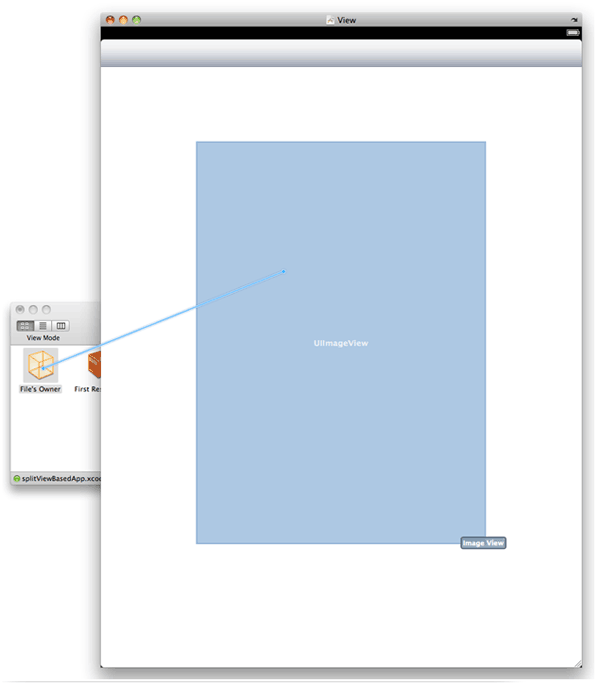 In Xcode, add the images as shown in Figure 13 to the Resources folder. Figure 13. Adding some images to the Resources folder. Control-click and drag the File's Owner item and drop it over the ImageView. Select imageView (see Figure 14). the item associated with the selected row. Here, you start by initializing a mutable array with list of movie names. The value returned by the tableView:numberOfRowsInSection: method sets the number of rows to be displayed, and this case it is the size of the mutable array. The tableView:cellForRowAtIndexPath: method is fired for each item in the mutable array, thereby populating the Table view. When an item is selected in the Table view, you will pass the movie selected to the DetailViewController object via its detailItem property. In the DetailViewController.m file, you modified the setDetailItem: method (which is really a setter for the detailItem property) so that an image can be displayed. For the image name, you simply append a ".jpg" to the movie name. Press Command-R to test the application on the iPhone Simulator. 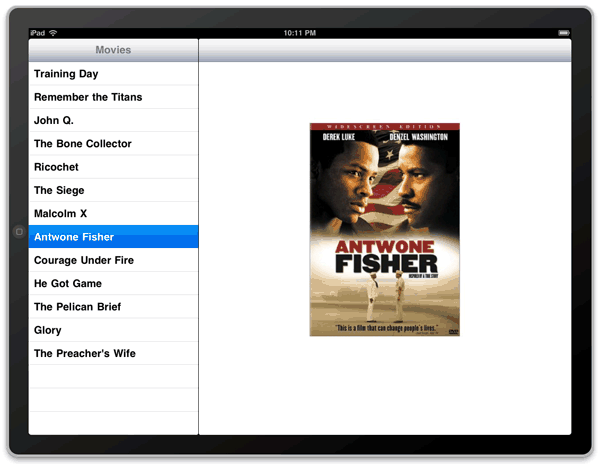 The following shows that when the simulator is in landscape mode, the application shows a list of movies on the left of the application (see Figure 15). Selecting a movie displays the movie image. 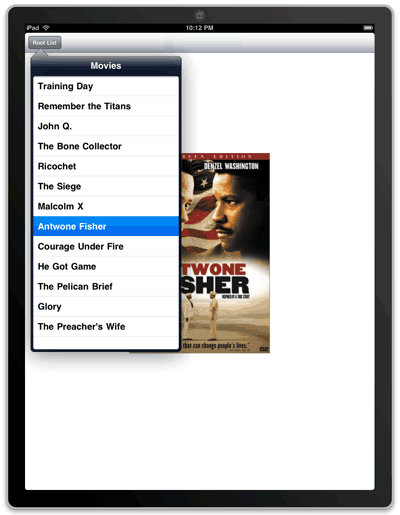 You can also switch to portrait mode and select the movies from the PopoverView (see Figure 16).